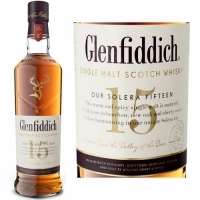 The richly layered Glenfiddich 15 Year Old single malt Scotch whisky is matured in three types of oak cask: sherry, bourbon and new oak. An intriguingly complex aroma. Sweet heather honey and vanilla fudge combined with rich dark fruits. Silky smooth, revealing layers of sherry oak, marzipan, cinnamon and ginger. Full-bodied and bursting with flavor. Satisfyingly rich with lingering sweetness.